The bold story of Maya Lin, the visionary artist-architect who designed the Vietnam Veterans Memorial. You may be familiar with the iconic Vietnam Veterans Memorial. But do you know about the artist-architect who created this landmark? Jeanne Walker Harvey studied literature and psychology at Stanford University and has had many jobs, ranging from being a roller coaster ride operator to an attorney and, most recently a middle school teacher of Language Arts and writing workshops. She is the author of several books for young readers, including My Hands Sing the Blues: Romare Bearden's Childhood Journey. She lives in California. Dow Phumiruk is a general pediatrician with a passion for art. She lives in Colorado with her husband and three girls. When she is not teaching medical students or drawing, she can be found hiking on the trails near her home. 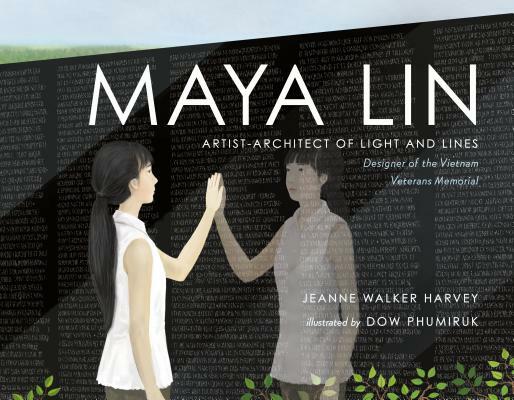 Maya Lin is her picture book debut.